Heeft u een vraag voor Jenny Hostel? Gelegen in Haad Rin is Jenny Hostel de perfecte keuze voor reizigers die Koh Phangan eiland en omgeving willen bekijken. Het hotel ligt slechts 14.5 km van het stadscentrum: lokale bezienswaardigheden zijn dus snel te bereiken. Voor 'sightseeing' en lokale attracties kan men terecht in de buurt van het hotel, dat nabij Haad Rin Beach, Haad Rin Arena, Phangan Duikers ligt. Het Jenny Hostel biedt gasten superieure dienstverlening plus een breed scala aan voorzieningen en is toegewijd om uw verblijf zo comfortabel als mogelijk te maken. Het hotel heeft een uitgebreid aanbod aan services, inclusief wi-fi in openbare ruimtes, parkeerplaats, restaurant, tours, wasserij. Gasten kunnen kiezen uit 3 kamers, stuk voor stuk plezierig en comfortabel ingericht. Daarnaast garanderen de talrijke recreatieve mogelijkheden dat u zich tijdens uw verblijf kunt vermaken in het hotel. Het Jenny Hostel is een slimme keuze voor mensen die reizen naar Koh Phangan eiland: een ontspannen verblijf is gegarandeerd. Very very strategic location, helpful & kind host & clean! Very strategic location as it's only 2mins walk away to the Haad Rin's beach & near to almost all the attraction around the beach. 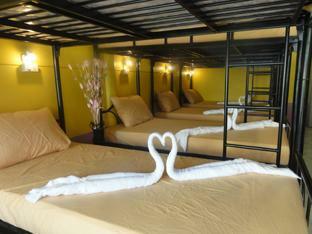 Variety of eating place around, shop to rent bike & massage place is just in front of the hostel. Wifi is great too inside the dorms & public area, plenty of bathrooms with hot water too & they're really clean compared to dorms in Koh Phi Phi, what else could I ask for right. And the owner, Jenny, not trying to exagerate but ohh no words can describe her kindness, friendliness, she really cares for all our hospitality during the stay. She's like a mom to me. I'd highly recommend this place! I booked this hostel in advance because many friends warned me that around the Full Moon Party, it is hard to find a hostel in Haad Rin. Not many people have heard about this place so ask for directions to "Yogurt Home", which is right across the street. I arrived two days before the FMP and had the entire room to myself the first night. 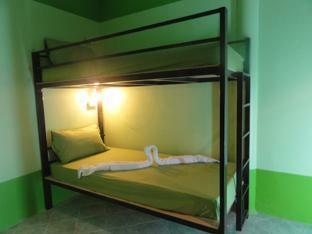 Jenny is super nice, the hostel is very very clean, nice beds, and free small lockers. Only a few toilets and showers for many people, however. The air-con works great (I had to turn it off the first night because it got too cold) and is a blessing when you wake up hungover in the morning. The hostel is also literally 50 m from the Full Moon Party beach, which is fantastic! Even though it's so close the party, it's very very quiet in the room, you don't hear the noise from the street or even from the hallway at all. You get a towel and a blanket (which really is just another oversized towel, but it didn't bother me). I paid 700 baht/night by booking on Agoda - those who showed up the day before and the day of the full moon paid 1000 baht/night - so beware that booking ahead will save you quite a bit. Overall, I would definitely stay there again! Our stay was amazing! 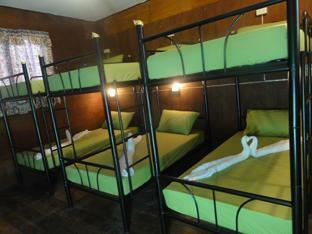 The rooms were very clean and we were provided towels and bedding. The only problem was that the mattresses were rock solid and I had a sore in my hip the following morning from the firmness of the mattresses. The main owner was very helpful with regards to the Full Moon party celebrations and offered paint and she informed us that we wouldn't have to pay the 100THB to enter the beach seeing as we were so close to the beach. That brings me to the best and last point: the beach was SO close! It was a 2 minute walk from our bed to the beach and I absolutely loved that. This hostel is perfect for a student traveller on a budget who wants to have a good time and doesn't care to sleep all day! הוסטל חביב, ממש במרכז העיר. השרותים והמקלחת לא הכי נקיים. שקט בלילות..ואילה מקום אם באתם/ן רק לפול מון.